The Rebel Sweetheart. 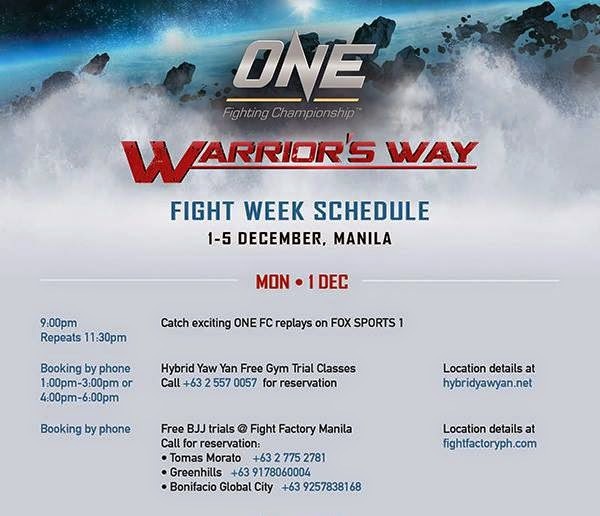 : One FC: Warrior's Way | Gearing Up for Fight Week! One FC: Warrior's Way | Gearing Up for Fight Week! One FC, Asia's largest mixed martial arts organization, has prepared a series of engaging pre-fight events for the public to witness and enjoy. Fans, partners, and media will get an opportunity to spend some time with the world-class stars billed on the December 5 event. Tuesday (December 2) will provide the media the opportunity to witness three of the country’s best in action. 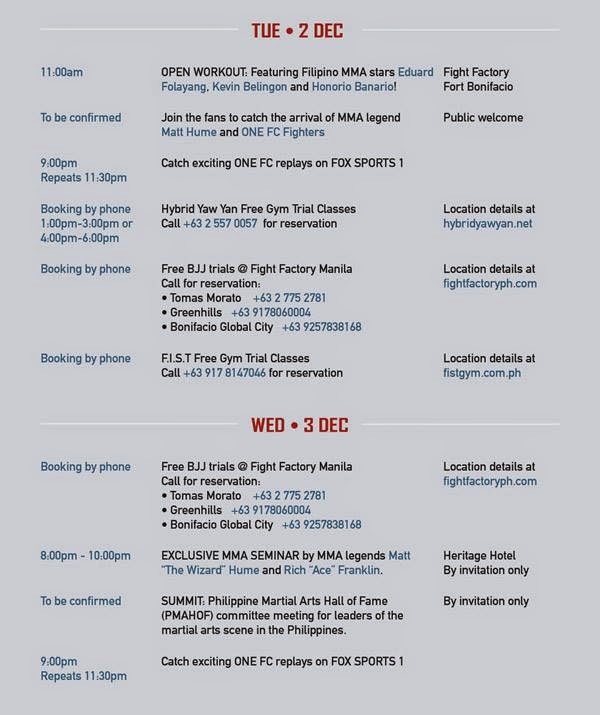 Eduard Folayang, Honorio Banario, Kevin Belingon, Ana Julaton, and Brandon Vera will conduct an open workout session, where they will showcase their skills as well as share with the country their mindset ahead of the upcoming clashes at One FC: Warrior's Way. The event will be at Fight Factory at Karport, Bonifacio Global City at 1 p.m. Selected gym partners will also be in for a treat as one of the greatest minds in the sport today, One FC Vice President of Operations, Matt Hume will be imparting his skills in an MMA seminar. Several of Hume’s students have gone on to win world championships and he will share his knowledge with a few lucky gym partners. There will also a summit for some of the martial arts leaders in the country on that day. December 2 and 3 activities. Fans looking to experience the training regime of these highly trained athletes now also get the opportunity to do so, with free trials at several gyms that are part of the One FC network. These gyms have produced talented mixed martial artists, several of whom have eventually gone on to compete against world-class stars at One FC. The events will then culminate with the weigh-ins at the Mall Of Asia Atrium. This will be the last chance to catch the stars of One FC as they make their final public appearance and face off with their opponent ahead of their anticipated bouts the following day. December 4 and 5 activities. 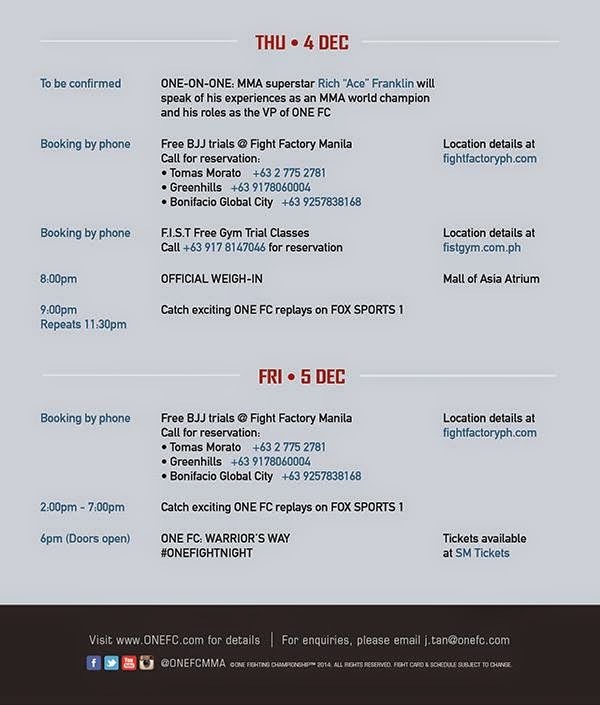 Finally, on 5 December, Manila will become the epicentre for world-class mixed martial arts action. One FC: Warrior's Way will happen live at MOA Arena and will be broadcast all around the world as the best mixed martial artists in the world do battle inside the One FC cage! Looks like you have some good entertainment coming up. Those guys are tough. This sounds like a huge event. I hope it goes well and no injuries. I took karate for over a year, martial arts are great exercise! It's not something I enjoy watching, but I think everyone should try it sometime in their youth! This sounds like an amazing event. It would be nice to get involved in something like this. Thanks for sharing.